No, F.A.M.E NYC is not talking about Obama. We mean the king of Afrobeat! FELA! has returned to Broadway for a limited engagement at the Al Hirschfeld Theatre, located on W. 45th Street, until August 4. FELA! 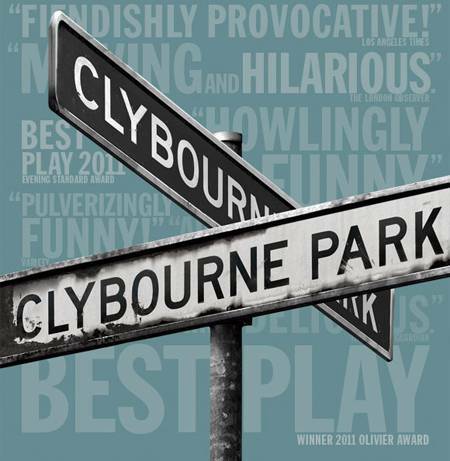 is one of the most exciting musicals to hit the theatre community in ages. During its original run it won Tony Awards for Best Choreography, Best Costume Design for a Musical and Best Sound Design of a Musical. Now back in NYC for a brief period during its world tour, it would be criminal for anyone to miss it again. FELA! delivers bolts of lightening to the audience, but you don’t have to believe me…take a look. And while you’re at it…take a look at what F.A.M.E NYC had to say about this trailblazing musical,https://famenycmagazine.com/2009/12/30/the-black-president-comes-to-the-great-white-way-top-broadway-production-2009/. Having lunch in any one of the many parks in Manhattan is a delight that comes with summer, and on Thursdays in Bryant Park you can have lunch and a show. 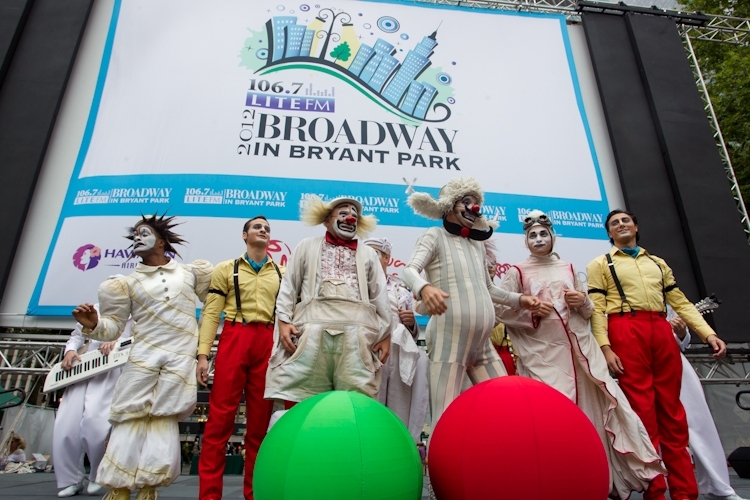 Now in its 12th season, 106.7 Lite FM’s Broadway in Bryant Park continues to provide New Yorkers with a glimpse of the nightly magic of Broadway and Off-Broadway’s most popular shows. The free event runs for a consecutive six week period through July and August, is sponsored by Resorts World Casino New York City and is hosted by a 106.7 Lite FM on-air personality. Yesterday’s show was hosted by Christine Nagy. The always awe-inspiring performers of Cirque du Soleil’s Zarkana kicked-off the festivities with a synchronized flag and animated feature show. Donna Vivino and Fate Fahrner gave a wickedly good rendition of “For Good”. Cast members from MEMPHIS transported the audience back to the golden era of rock and roll with “Music of My Soul”. The women of Sister Act were fierce as they sang “Fabulous Baby” and the “Unchained Melody” of the Righteous Brothers rounded out the show as Richard Fleeshman of Ghost had the audience participating in a sing-along. 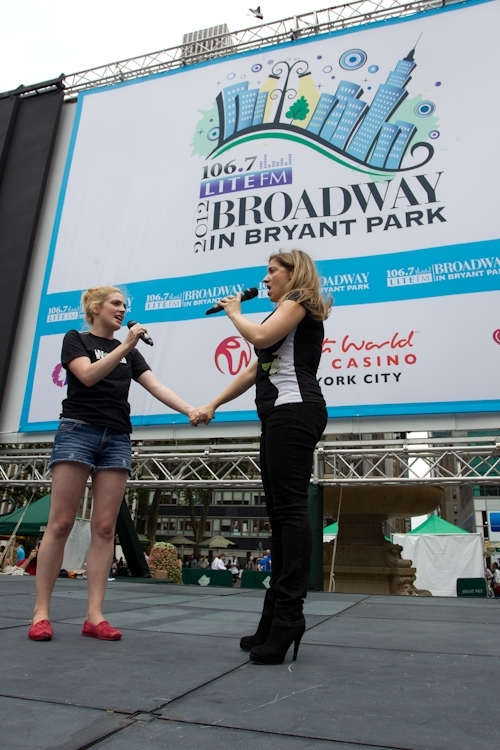 106.7 Lite FM’s Broadway in Bryant Park will run from 12:30-1:30 pm every Thursday ending with its final group of performances on August16. Lawn seating is provided on a first-come, first-served basis. Attendees will also have the opportunity to win a family four pack of Broadway tickets for an entire year courtesy of Resorts World Casino New York City. Enter by visiting the Resorts World Casino New York City tent on the Bryant Park fountain terrace from 11 am – 2 pm on any of the remaining performances.